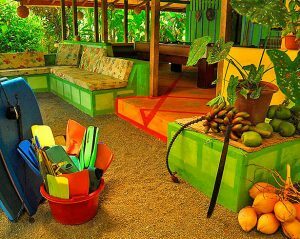 The Beach House will be your first stop when arriving at Finca Exotica. Rightly named because of its close proximity to the beach, this building has a wonderful history to it. Dated to be over 50 years old, this was the original ´pulperia´ (corner store) of Carate, serving the many goldminers of the area at the time with basic food supplies such as flour and rice. It must have had quite a different atmosphere back then! We have extended the building to help serve its many current purposes. Our main office is located at this site, where we always have a staff member available to answer any questions you have between 8 am and 2 pm. When you arrive, we will invite you to the office to complete a check in form and explain basic information to you about your stay. The Beach House is always open so take full advantage of the pool table and please just remember to keep the noise down after 8pm as some of our workers live here also and are early risers, tending to the garden from 6 am onwards. On arrival, we shall show you the route to the hammock area on the beach, as well as the communal bathrooms close by where you can rinse off after sea time. We have towels available at the Beach House for you to use, as well as boogie boards which are great fun to use on Playa Carate - see how many waves you can catch and go with the flow! Swimming is tide dependent so if you are unsure of how to read the tide chart found by the boogie boards, please let us know and we will happily explain to you how it works to ensure safe swimming time for you and your loved ones. 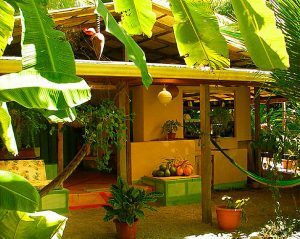 Did you forget to bring a reading book for your Costa Rica vacations? No worries! Have a browse to see what peaks your fancy and feel free to read until your heart´s content. We have a good selection of novels and other reading materials in English, Spanish and German. You can also donate any books you bring with you if you do not want to take them home, we are happy adoptive book parents, one can never have too many books!